April is my birth month when summer bursts like wild fire. 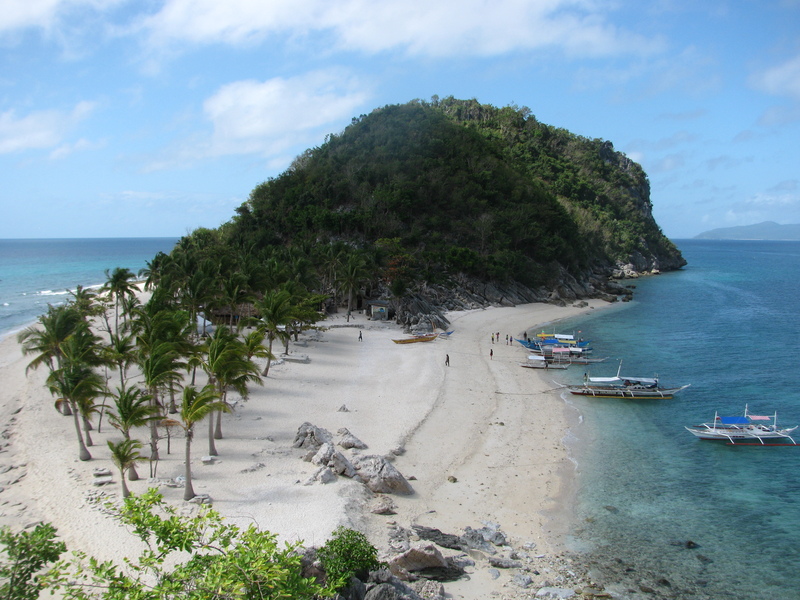 With its looming arrival, I am like a giddy child waiting in full anticipation at its doorstep, and yes it’s no less than to bask in the sun at Isla Gigantes, Iloilo. Despite the busy schedule and the budget dilemmas that may impede the plan; struggling almost 17 hours of sea and land travels, this place is worth the sacrifice. As always nature never fails to spark my spirit. With every departures, I yearn to arrive in my next destination in discovery of places, in living my life. The stone balance marker at Cabugao Island. As we set foot at the base of the famed photo spot of Cabugao Island, our tour guide Sir Joseph once told us never to touch the stone markers. It made me think that the Island was something mysterious that an impending danger will mock to those who failed to obey. Maybe the mountaineers and local animists have put that in place to serve as a natural compass or the structure of the piled pebbles teach wanderers alike the nature’s law of symmetry and balance. With its cunning location, I had no qualms of disobedience. We walked past through it and climbed up our way to the steep rock and rewarded ourselves with the breathtaking view of the outlying stretch of the Island. Then I remembered the apocalyptic remark of our tour guide about the stones. It was there to remind us about our journey going to the top: to walk in diligence. The dharma behind it is how you become a spectator and the same time the main character in this great imagery that lies infront of you: the various colors, intricacies of nature – its seascapes, the rugged rocks and the scattered islands spewed out due to a volcanic reaction many years ago. Time and nature are of essential marriage. The pristine white sand beaches and turquoise colored waters with its off beat charm have a calming and luring effect that when you go home, part of you wants to own a tiny place of this reality; you ought to stay. Cabugao Island and Bantique Sand bar are of those places where you can fondly say that it its virginal, uncharted and simply mystically alluring despite the demographic demands of wandering people. Cabugao Island, at its finest. 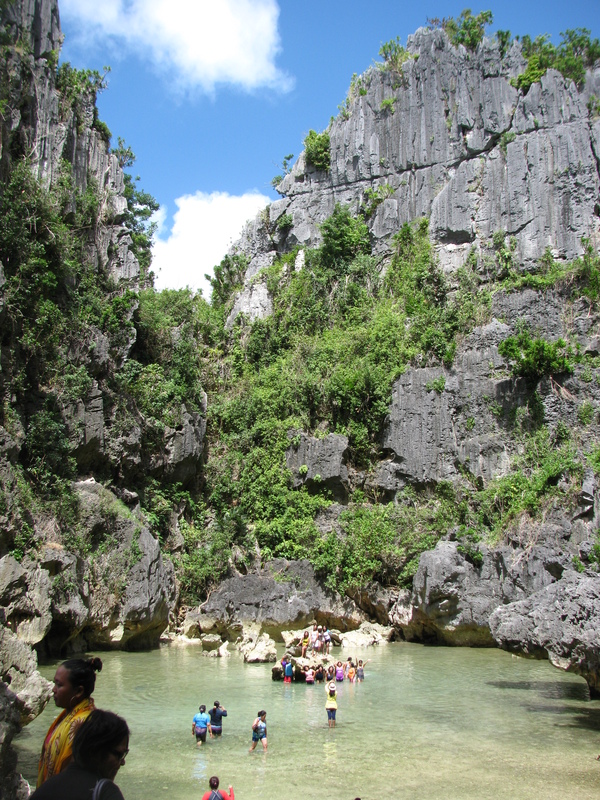 One may feel that they’re set foot in Thailand or in El Nido Palawan with Gigante’s very own Tangke saltwater lagoon. Getting there was already a challenge as you will be greeted by an entrance of steep rocks. The towering rocks are home to many monkeys nestling at the burgeoning shrubs and branches. During high tide, the waters turn greenish blue. It was an amazing sight to look at a shallow water separated by a mountain or rocks and outside surrounding it is a bigger body of water – the sea. The saltwater lagoon and the rugged rock formations. This island is also rich in architecture as this also became a docking frontier and lighthouses to Spanish times’ marine navigation. The decorative emblems on its window although dilapidated with the passing of time, still bears its former stronghold. Isla Gigante’s travel itinerary will not be complete without hurdling through the life changing obstacles of Pawican Caves. It was one of the best spelunking experience I would never forget aside from the eeriness it gave when you will be introduced at the entrance to the skeletal remains lying at the chamber . You also have a cave guide whose presence you’re not so sure of either to test your fear or wheter or not to save you if something went awful because his surprises are guarded in silence. The challenge is to secure that you will get out unscathed; maneuvering the entrances and exits without a set of protective gears. The caves are known for its spacious caverns and difficult holes. You will have your full view of in what they call as the Boulevard. The greatest challenge is to outwit the sharp and rugged rocks forming at the steep paths as you make your way down to the base of the mountain. The 360 full view of the entire Island. 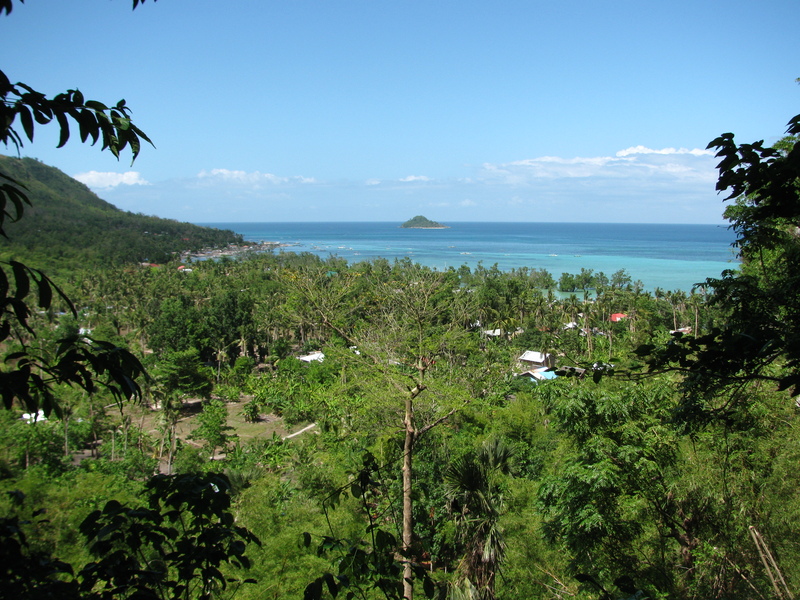 The island is abundant of scallops; beaming its crown as the scallops capital of the Philippines though it’s still undocumented and unconfirmed. But for us, the dining table is undoubtedly best scallops feast I’ve been to. No wonder, heaps and mounds of empty shells were seen in every household yard of Barangay Asluman in Gigantes Norte. The collaborative efforts of providing roughly 50 kilos daily supply of scallops to the resort and tourists already ensure alternative means of livelihood among the residents. They’re not only fishermen but as tour guides, drivers, cooks and attendants on the peak summer season. 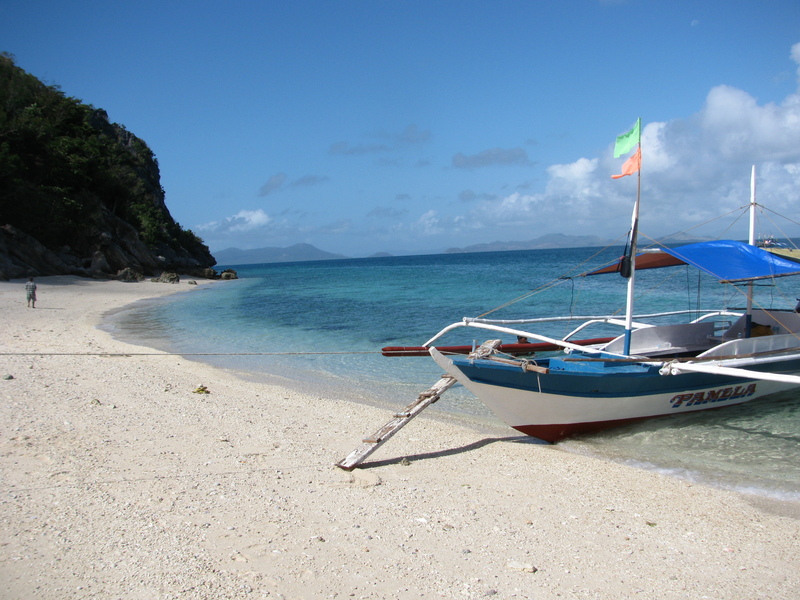 With its natural endowments, no doubt tourism is thriving at Isla Gigantes. But I fear for its beauty and fragility. It may sound rude to say that I wish this place has never been known as it is today; to remain untouched by human greediness. I hope that the residents will never be lured for a short term financial gains at the expense of a long term effects of allowing the Islands to dominated by real estate and business tycoons. We already have a mortified Boracay Island and that is enough. As the structure of the stones at Cabugao Island have also visibly reminded us that even a single pebble is also as important in the balance of nature. Everyone is important in the cycle of life.